Uzbekistan Dance consists of between 15-20 thousand movements by a performer, depending on the complexity of the dance. Uzbek dance portrays a story, told by the flowing movements and rhythm. The lithe and expressive hands of a dancer raise and then interweave like two twigs of an almond tree, then one hand is above the head and the other is making swift movements around the body. A medieval poet wrote: "A dancing woman! She is swiftly dancing, spinning like snow carried away by a whirlwind. Restless, she is spinning to the left and to the right". There are three schools of dance in Uzbekistan: Khorezm, Fergana and Bukhara. Each one has its peculiarities and specific features. Khorezm dance is well-known because of its fiery nature. The most popular of the dances is "Lazgi", which both young and old dance. The music consists of an introduction and main body including folk melodies. Six or eight dimensional flowers are portrayed. At the start, slow and simple dance movements are made with the fingers, wrists and shoulders, and then the whole body starts to move. The pace accelerates and becomes increasingly energetic. Men and women dance it very differently. At the present time, there are 9 types of dance in Khorezm: "Kairat lazgi", "Musical lazgi","Hey lazgi". In contrast to the Khorezm fiery dance, the Fergana dance is fluent and lyrical, with smooth rounded movements of dancers’ hands which are able to tell a legend, to convey a range of human emotions in a picturesque way, or to describe the beauty of nature. An ancient dance, "Katta Uyin" (Big Game) or "Nagora Uyin" (Psaltery Game), is usually danced in large groups during popular holidays or weddings, and is accompanied by the following musical instruments: Nagora (Psaltery), Doira (Percussion), Karnai and Surnai (Wind). The Bukhara dance is complex and measured. Some local monuments of the early middle ages portray this original art and its place in the life and culture of the residents of the Bukhara Region. On spring evenings, young girls used to meet in the yards with large pools (Khaus), and to dance around the pools, accompanied by simple musical instruments – Chang or Kobus. Women would also sit around the gatherings to make the accompaniment of wooden spoons and small Doira(Round) and Tambourine. Other Bukhara dances were accompanied by Kairaks, or Castanets (stone plates), and the dances with hand accompanied by Bells, or Zangs. 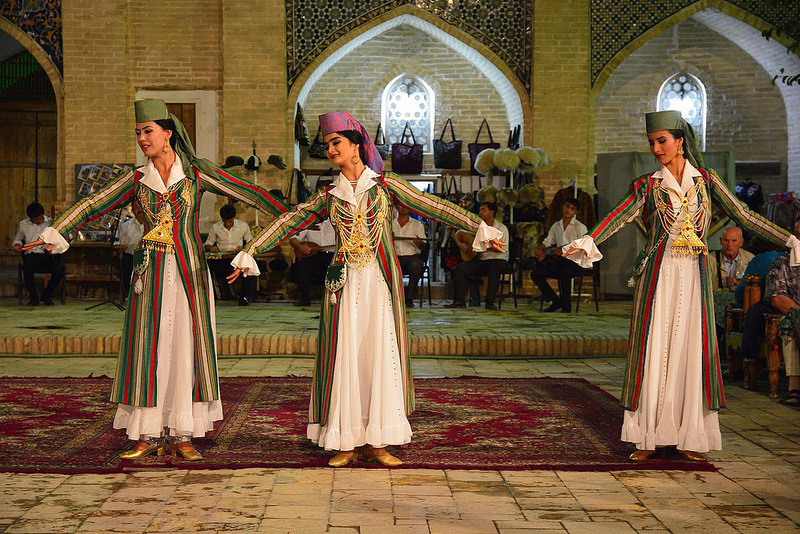 Bukhara dances, such as the "Tanovar", are still popular in modern society. The "Tanovar" originated in the Fergana valley, and was performed as a chamber dance for a small, mainly female, audience. It was danced to the accompaniment of a lyrical folk song.